The scheme offers citizens of 80 countries the chance to visit Belarus without a visa for up to five days. It was signed into law by the Belarusian President last year and it’s hoped to encourage trade and tourism to the nation. The list of accepted countries includes all EU states (it’ll be interesting to see what happens to UK visitors after Brexit), as well as USA, Brazil and Japan. The visa-free border checkpoint has been established at Minsk International Airport. Citizens outwith the 80 agreed nations cannot access the scheme and will still be required to apply for a visa. In addition, state and diplomatic visits are not covered (that’s most of my trips out, then…). Those with special passports are also exempt. Not so special, after all, huh?? If you’re on a multi-stop trip and plan to visit Belarus via its neighbour, then think again. Even if you meet all the criteria and hold valid documentation, you cannot utilise the scheme as a foreigner if you fly to Minsk directly from Russia. Bang goes that connecting flight from St Petersburg, then. Although flights are technically considered domestic travel, all normal visa rules apply. Now that the visa-free travel scheme is in place, there’s no limit on the number of times it can be used. If the required conditions are met, you can enjoy visa-free travel for up to 5 days and visit Belarus as often as you like. And when there’s scenery like this to be enjoyed, who wouldn’t want to take advantage of that? 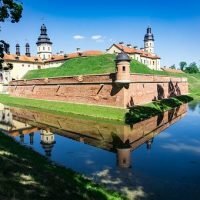 Who wants to visit Belarus?